Pop artist Andy Warhol was obsessed with Polaroids. In the 1970s, long before digital photography, these photographs that instantly developed themselves were a wonder – and very convenient for artists. The “Prince of Pop Art” made hundreds of Polaroids as sketches for his Pop Art portraits. An album of Warhol’s Polaroids came to the Arkansas Arts Center as a gift from the Andy Warhol Foundation in 2013. The Polaroids in this Little Red Book from 1975 were source material for a portfolio of prints related to a suite of 105 paintings, both titled Ladies and Gentlemen, commissioned by an Italian art dealer. To show Warhol’s Polaroids of drag queens and transgender women of color in context, the curators of the Arkansas Arts Center rifled through the vaults in search of Warhol’s peers. They found a treasure trove of Pop Art and art from related movements, on view in POP! Out of the Vault. The Arts Center is lucky to have some rare examples of the first version of Pop Art, which arose in Britain in the 1950s. There, the artists of the Independent Group created collages that used American magazine pictures to mock the commercialism of contemporary life. Eduardo Paolozzi, a leading IG artist, made collages, but also gathered popular imagery in prints, drawings, and sculptures like the Arts Center’s Triple Fuse. In the early 1960s, young Americans created their own, independent version of Pop Art as they turned away from the hyper-expressive Abstract Expressionist works that had dominated American art through the 1940s and 1950s. Roy Lichtenstein, Andy Warhol, James Rosenquist, Claes Oldenburg, and Mel Ramos were among the first American Pop artists. They shocked art critics by making fine art paintings and sculpture that appropriated mass-produced commercial images. Lichtenstein used the colorful, hard-edged visual language of commercial art to reimagine a procession of different artistic subjects and movements from comic books to cubism. Warhol mass-created his paintings and prints of soup cans and celebrities using the process of silkscreen that had formerly been used to print posters and packaging. Rosenquist, a former billboard painter, used the giant scale and bland imagery of advertising to make compelling murals. Oldenburg turned the dignified tradition of monumental sculpture on its head with his giant hamburgers and clothes pins. Ramos, who was working in California while the others worked on the East Coast, appropriated images of Superman, Wonder Woman, and other heroes before he began creating his signature pin-up advertising women and his sendups of famous art works. At about the same time that American Pop artists were beginning their work, other artists found their own ways of reacting against Abstract Expressionism. In England, painter and printmaker Patrick Caulfield found an elegant modernist approach to every-day subject matter. Often referred to as a Pop artist, Caulfield abhorred the label. In California’s San Francisco Bay Area, an irreverent approach to art took the form of self-depreciating, ironic Funk Art. Again, the label is a convenience for critics or collectors – the artists were independent of each other. David Gilhooly even founded his own ceramic amphibian-based planet – The FrogWorld. 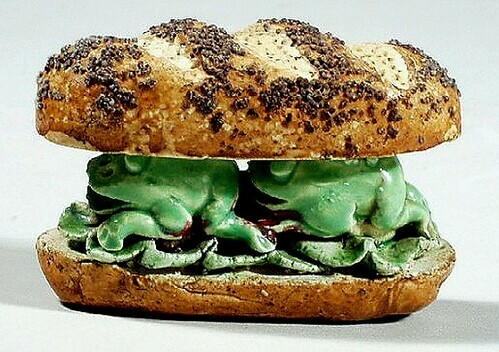 Frog sandwich, anyone? Above Right Image: David Gilhooly, American (Auburn, California, 1943 – 2013, Newport, Oregon), Mini Frog Sub, 1980, hand-built, glazed low-fire whiteware, 2 ¼ x 1 3/8 inches, Arkansas Arts Center Foundation Collection: Gift from the Diane and Sandy Besser Collection, 1987.043.003. Andy Warhol, American (Pittsburgh, Pennsylvania, 1931 – 1987, New York, New York), Little Red Book, 9 - Ladies and Gentlemen (E.M.), January 31, 1975, Polaroid – Polacolor type 88, Arkansas Arts Center Foundation Collection: Gift of the Andy Warhol Foundation for the Visual Arts, Inc., New York, New York, 2013.015. Andy Warhol, American (Pittsburgh, Pennsylvania, 1931 - 1987, New York, New York), Lincoln Center Ticket, 1967, silkscreen on opaque acrylic, 45 1/4 x 24 1/4 inches, Arkansas Arts Center Foundation Collection: Gift of the American Art Foundation. 1979.073.001.011. ©Andy Warhol Foundation for the Visual Arts / Artists Rights Society (ARS), New York. Gottfried Helnwein, Austrian (Vienna, Austria, 1948 - ), Marilyn, 1992, lithograph, 30 1/4 x 23 1/2 inches, Arkansas Arts Center Foundation Collection: Gift of Modernism Inc., San Francisco, California. 1993.020. © Gottfried Helnwein. Roy Lichtenstein, American (New York, New York, 1923 - 1997, New York, New York), Study for Aviation, 1967, graphite, crayon, collage on paper, 22 3/4 x 27 1/4 inches, Arkansas Arts Center Foundation Collection: Purchase, Tabriz Fund and Museum Purchase Plan of the NEA. 1976.019. © Estate of Roy Lichtenstein. Larry Rivers, American (New York, New York, 1923 - 2002, Southampton, New York), De Kooning with My Texas Hat, circa 1963, graphite on paper, 14 x 17 inches, Arkansas Arts Center Foundation Collection: Purchase, Tabriz Fund and Museum Purchase Plan of the NEA. 1976.012. © Estate of Larry Rivers / Artists Rights Society, New York.